I got up late today so I didn’t receive my husband’s text in my phone. Besides, I didn’t pay attention for I am not waiting for any text message for this morning. Until, my set picture message alert ringed. I was a little bit curious for who would like to send me a picture message without me expecting anyone. Opened it, it was from my hubby and a messy car. Papers were on the seat and the glove box is opened too. I haven’t read his first text message yet, and I just opened the picture sms saying ‘messy’. Read his previous text and I was right, we got a messy car for someone is trying to steal something inside our car. How did they get in? Well, first our door keys don’t work. So we don’t lock it and knowing that we do parked our car in our driveway. Since, we knew that our car doors don’t work, we don’t leave any important things inside, and even if it gets lock I am not comfortable of leaving any variable items inside our car. Nothing’s messing, good thing they didn’t took my husband’s tools which is in the trunk. It must be some punk kids who want to steal something for an exchange of drugs. I kid you some part of our blocks where some random people who have issues. This is the third time it happened to our poor Honda. First was when we visited my mother in law at the hospital, we parked our car across the Hospital’s parking area and when we opened our doors, there messy seats. And the two couple was here in our private property. We were speculating if our tenant’s car has been touch too. We will find it out. Delighted to say, nothing mischief done. Things can be replaced, but just too inadequate to think that you can’t be safe even in your own private property. oh boy! Good that they didn't take your car away sis..we use to leave valuable things in our car especially our cameras if we're on trip..but we always make sure that the car is lock..good thing nothing happens..be careful always sis. Man! That's terrible! I pray it doesn't happen again to you. We're no longer safe anywhere in the world so we better be extra careful. i'm glad you're safe. we can only be too cautious these days. a lot of people are just plain bad! 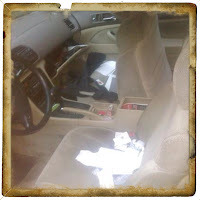 Somebody just broke my side window months ago and stole my purse.Our car was locked and was parked outside the church. When the cops came and asked me several questions I am trying to speak but nothing comes out of my mouth because I am so shocked. I know how it feels girl and I'm glad you and your family are safe. I'm glad nothing important was stolen. Those street kids will do anything just for drug. I hope this will never happen again. glad nothing was stolen Nova, you are smart not to leave any valuables in your car, and thankfully, they also did not drive your car away. yes, sometimes, we do forget the keys in our car, and people can easily drive the car away when we have the keys there. hope those who did it will soon be trapped in a situation where they will be caught. ayay, I hate when people doing such a thing like this...good to know you guys are safe. You're right, it's good nothing happened to you. Still, like you said, it can be rather depressing to know your property, or yourselves for that matter, may no longer be safe in your own private place. Very disturbing, indeed. Have you reported the incident to the authorities? I hope whoever did this to you face jail time so they learn their lesson. that's horrible! good news nothing is hurt and stolen in your car. Be safe always. Good thing, nothing was stolen.. Time have change na talaga, these car robbers are so daring. Buti na lang, hindi mismo yung Honda mo ang kinuha. well that means you have to add a little security to your car let's say like alarms and stuff. probably just some pimps messing up someone elses car to get some fun... that aint sure fun. Grabe na talaga ang mga masasamang loob ngayon. Good thing wala naman po ng nawala.